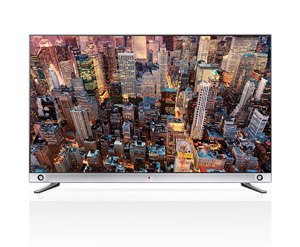 The 65LA9650 is LG's attempt at bringing down the price of 4K LED TVs. The LA9650 is the lower end of two "reasonably" priced 4K series with the LA9700 being the premium model. One of the best picture quality features on the LA9650 is the IPS LED panel. We've seen these on Panasonic LED TVs this year and the performance is always impressive. Side angle viewing sees the biggest benefit from this type of panel. Color reproduction is also bumped up a bit. The 65LA9650 also features the full LG Smart TV platform and the Magic Remote with the best voice recognition that we tested this year. Compared to the LA9700 model, the speakers are less poewrful, there is no NANO Full LED panel, and the design is a bit different. The 65LA9650 is also $1,500 less than the 65LA9700. The picture quality of the 65LA9650 strong thanks to a few different features. The biggest in the improvement to side angle viewing. This is one of our biggest qualms with 4K displays. Why pay the high price for poor 4K viewing angles and OLED tech or an excellent plasma is a viable option? The IPS panel on the LA9650 gets a more out of the angles and other LED TVs. It's not perfect, but much more of what you would expect out of a top tier TV. The LED Plus technology provides local dimming for excellent contrast and color control. The result is a super sharp picture with realistic color reproduction. 4K upscaling is a big deal with 4K TVs right now since the amount of content is very limited and the distribution of it really isn't in place. LG claims to have extra steps in their upconversion process to coax a better picture out of upscaled material. This will keep all of your current devices relevant even though the resolutions aren't up to 4K standards. The first thing you notice about the LG 65LA9650 is the two legged stand. It is two different pieces that attach to almost the extreme left and right of the TV. This brings up a problem we have seen with TVs like the F8000. The width of the stand may be too wide for some TV stands making wall mounting a better option. This is good to know before getting it home. It has the same super thin bezels and profile that we have seen in all the other Cinema Screen design TVs from this year. LG's Smart TV platform is a welcome addition to the 65LA9650. You are going to find many of the offerings present in all manufacturers' smart TV platforms. Thing like Netflix, Hulu Plus, YouTube, MLB.tv, Facebook, and Twitter are now the standard. They offer an extensive array of Apps such as Puzzle Quest, Germs Palace, and the White House. The selection is complete and pretty compatible with other manufacturers. It's very attractively laid out and super easy to control with the Magic Motion Remote Control. There are a number of new interaction features as well for smartphones and tablets. Near Field Communication (NFC), Miracast, and Widi are just a few ways to bring content to the big screen from your mobile device. The new Magic Wand Remote included with the 65LA9650 has seen a number of improvement since last year. In our reviews last year, we thought the magic remote was a handy inclusion that really helped navigation in the menus and in the web browser. We are happy to welcome it again with new voice features. The LA9650 magic remote doesn't have the QWERTY keyboard that is present on LG's new Google TVs, but that's okay. The 65LA9650 is available for $5,000. The picture quality is solid and the Smart TV and Magic Remote combination provides a lot of value for the overall package. The sound may not be as strong as the other TVs, but sound quality from LG has been up this year and that proves true here. Both the Sony XBR-65X850A and the Samsung UN65F9000 are available for the same price of $5,000. Sony's picture quality is fantastic while the Samsung's feature set is one of the strongest.